Ryan Bell was born and raised in Sarnia, where he attended King George and Northern Collegiate. Ryan received an Honours Degree in Philosophy from McMaster in 2004 and earned his J.D. from Western University in 2013. Ryan worked at GMSB LLP as a summer student and articling student before joining the firm as an associate upon his call to the Bar in 2014. 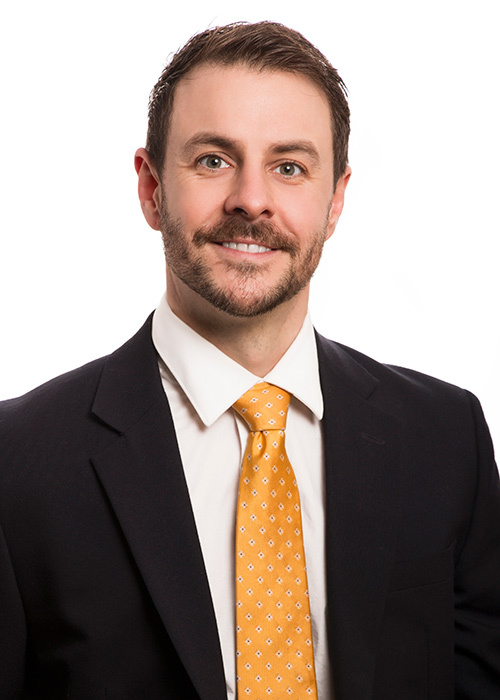 Ryan practices law in the footsteps of his father, D’Arcy Bell, and Ryan’s practice is similarly focused in real estate, wills and estates, corporate/commercial (including not-for-profit corporations), and municipal law/property development. He looks forward to forging long-lasting relationships with his father’s clients as well as new ones. Ryan is married to Lila Palychuk, who is an accountant at MPW Chartered Professional Accountants and serves on the boards of several community organizations. Ryan’s younger brother, Graham, is a former CPGA professional and now a financial adviser at Barill & Company in Sarnia. Ryan’s mother, Janis, is a retired nurse. Outside of work, Ryan is an avid reader, volunteer, indie music fan and concert-goer, video gamer, cook, and aspiring writer. In the summer months he enjoys many outdoor pursuits including camping, cycling, hiking and bad golf. Ryan currently serves as Chair of the Sarnia Lambton Children’s Aid Society, Chair of the Sarnia Lambton Chamber of Commerce, Vice-Chair of the Dow Centre for Youth, and on the Bluewater International Granfondo Committee.